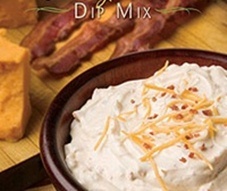 Smokey bacon and creamy bleu cheese flavors blended into perfection. For bacon stuffed mushrooms combine the mix with 8 oz. cream cheese. Wipe 16 mushrooms clean and remove the stem. Place 1 tbsp. cheese mixture into mushroom cap and sprinkle with topping. Bake at 400 degrees for 12 minutes or until done. 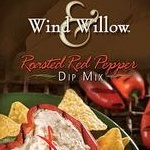 A delicious new twist on the old Southwest! You've love the subtle blend of Southwest spices rolled in tortilla strips. Whether serving it as a cheeseball, a sandwich spread, a potato topper or a salad show stopper . . . you're going to love this little packet of fun! To make Smokehouse Potato Skins bake the potatoes first. Cut in half lengthwise and scoop out the inside leaving the skin and about 1/2 inch thickness of potato. 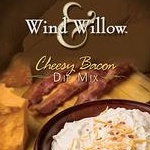 Combine cream cheese, butter and Smokehouse Bacon & Cheddar Mix. Mix until smooth and add potato. Mix together and then spoon into potato skins. Sprinkle with topping. 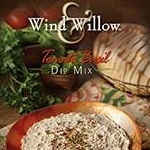 Place in baking dish and bake at 400 degrees until warm and mixture begins to brown. .
A great Cheeseball, of course! But also the base for fabulous appetizers and entrees. The taste of an Italian garden right in the mix. Just the right amount of spice to make this one fun dip. 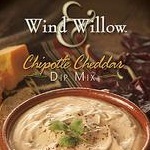 Perfect with crackers or tortilla chips or to add a little zip to tacos. 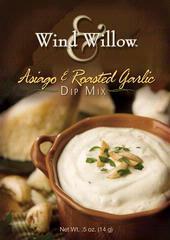 A flavorful dip with a ton of flavor. 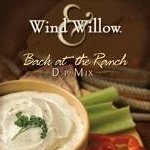 Add dry mix to hamburger recipes to take them everyday to special occasion! Add mayo and sour cream and you've got a party! We also love the easy recipes to use these mixes for Snack Mixes, Flavored Chips, and Pasta Salads! Fondue anyone? Once you've cooked your meat, take it for a dip! 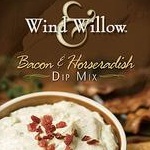 Also a fabulous topping for your baked potato. 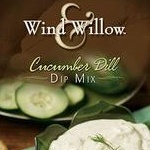 Give your next salad or fresh veggies some real zing with this zippy dip from Wind & Willow! Can a dip say "fresh"? You'll think you heard it! 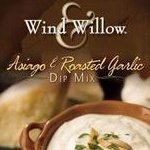 As a dip or a dressing for a fresh veggie and pasta salad it's wonderful. 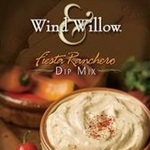 A wonderfull zippy full flavor cheese dip. You don't have to say cheese, the taste alone will make you smile. Fill a hollowed round loaf of bread and use bread pieces for dipping. Scrumptious! You've had ranch dips before you say? Try ours, and you'll wonder! 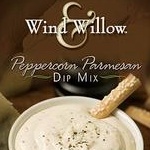 Best ranch dip ever! Two great flavors combine for savory satisfaction. 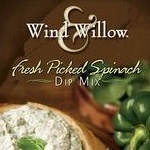 One of our favorite dips also makes a great sandwich spread. 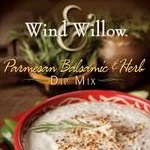 A rich blend of melted cheddar and sour cream that's great for dipping or to load on a baked potato. Cheese, peppers, and spices combine to create a wonderful southwest inspired hot dip with extra heat for tortilla, pita chips or a cracker. Serve it Hot! A great start to any Mexican meal or party.